On Episode 1 of UFC 225 Embedded, former lightweight champion Rafael Dos Anjos does media leading up to his interim title shot in a second weight class. Welterweight opponent Colby Covington continues his training at American Top Team, where he declares himself “King of Brazil,” then packs for his trip. Middleweight champion Robert Whittaker gets his bearings with secret stretches in the event’s host city of Chicago. On Episode 2 of UFC 225 Embedded, middleweight champion Robert Whittaker keeps things normal with frequent meals and family time. Australian heavyweight Tai Tuivasa, in town to fight legend Andrei Arlovski, struggles to understand the still waters of the Lake Michigan beach. Interim welterweight title contender Colby Covington turns a media trip into father-son bonding time, as opponent Rafael Dos Anjos trains alongside featherweight champion Cris Cyborg. Middleweight title challenger Yoel Romero does press in New York City. 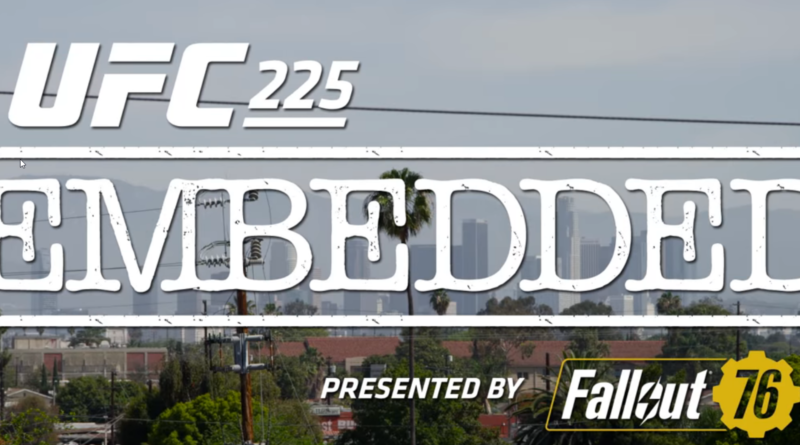 On Episode 3 of UFC 225 Embedded, interim welterweight title contender Colby Covington talks about the downside of his bad-guy persona, and middleweight champion Robert Whittaker destresses with a favorite pastime. Heavyweight Tai Tuivasa continues his Chicago takeover to the point that he steps in as tour guide. Fighters check in, including featherweight Megan Anderson and middleweight title challenger Yoel Romero, and the Australians on the card brave a cold-weather photo shoot. Chicago’s own UFC 225 stars CM Punk and Clay Guida provide musical entertainment at a Cubs game. On Episode 4 of UFC 225 Embedded, interim welterweight title contender Colby Covington continues his fight week family vacation. Featherweight Megan Anderson and welterweight title contender Rafael Dos Anjos continue to work their heavy hands in the training areas. Hotel ballrooms host a who’s-who of UFC 225, including middleweight champion Robert Whittaker, CM Punk, Ricardo Lamas, Andrei Arlovski and Holly Holm. Middleweight title challenger Yoel Romero joins the stars of the card for the official open workouts, where the Chicago fans make their favorites clear.